A CloudOps and Microsoft eBook on how to secure your containers in Azure with AKS. The Cloud Native world has flipped security on its head, requiring innovative thinking and assembly of architectures that depart from traditional enterprise design methods. Over the years, many development professionals became complacent with static, perimeter-based networking. This architecture has evolved into security models which safeguard dynamic server clusters whose IP Addresses constantly change. 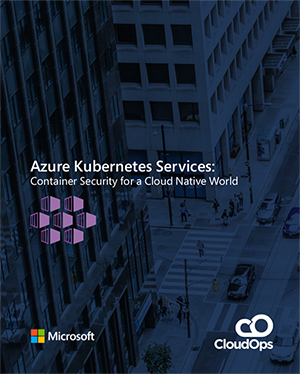 In this eBook, we explore the top five container security concerns that companies should be aware of and provide ways to improve the security of their Kubernetes clusters in Azure. Sign up and download this ebook today!